KJVIFB.com is a collection of four main blogs, including a Blogroll, Devotions, Sermons, and Quotes/Quips. Authors are welcome! First you need to join. If you are an Independent Fundamental Baptist with a blog of your own (on any topic! 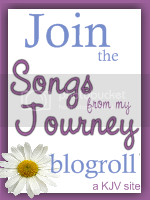 ), and if you use the KJV on your blog, you join by adding our button to your blog, and sending an email to kjvroberts@gmail.com. In your email state that in addition to joining, you would like to become a contributing author on the Main Page. I will add your name to the Authors List, and Blogger will send you an email for confirmation. You will then be able to write articles, or copy and paste your own articles, directly to the main page. Because we have over fifty authors, we ask that you only post occasionally to the Main Page (once a week or less). If your article is longer than one page view, add a jump break. There are details explaining how to do this at http://buzz.blogger.com/2009/09/you-might-as-well-jump.html. 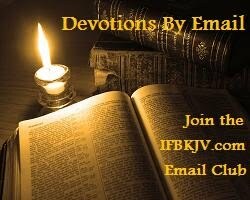 In your email state that in addition to joining, you would like to become a contributing author of Devotions. I will add your name to the Authors List, and Blogger will send you an email for confirmation. You will then be able to write articles, or copy and paste your own articles, directly to the devotional side of KJVIFB.com. Because of their daily nature, you can post a devotion every day (or as often as you choose). There is no limit on length, however, no pictures are allowed (due to widgets which display the devotional feed all over the internet). The title must include the date in month/day format (just follow the format others use), and you should tag your devotions with the same tagline every time. This tagline should include your name, and serves to categorize the devotionals by author on the sidebar. 3. Sermons - Little to no restrictions are made on sermons. As long as they have been preached in a local Independent, Fundamental Baptist church, and use the KJV, you may post them as often as you like, with no size restrictions. They can be in text or in outline format. In your email state that in addition to joining, you would like to become a contributing author of Sermons. Authors are not currently asked for re: quotes and quips; however, if you come across a good one (yours or attributed to someone), please email them as well.